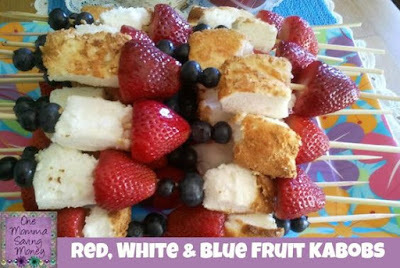 Looking for a fun and yummy dessert for a Memorial Day, 4th of July or Labor Day party? Then how about some Fruit Kabobs! Defrost Angel Food Cake. Slice the angel food cake and cut into square/rectangle pieces. Wash the strawberries and the blueberries and let them drain. I filled my sink with a water/white vinegar mixture to clean them. Remove the stem from the strawberries into quarters. I assembled my kabobs this way: strawberry, angel food cake, 2 blueberries, strawberry, angel food cake, and 2 blueberries. Keep assembling until you run out of ingredients. Line them up on serving dish! I assembled my kabobs this way: strawberry, angel food cake, 2 blueberries, strawberry, angel food cake, and 2 blueberries. Keep assembling until you run out of ingredients. Line them up on serving dish! Not a fan of angel food cake? How about these fun substitutions: pound cake, mini white cupcakes, etc. You can even switch up the berries.